It was only a matter of time before Dyson would decide to get into the robot vacuum cleaner business. Dyson, who prides themselves on technology, has revealed their latest invention, the 360 Eye robot, which is reported to have taken 16 years and $47 million to develop. 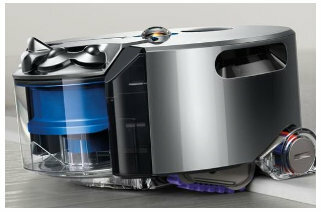 One of the innovations claimed by the Dyson 360 Eye is the way it decides the path taken to clean a room. The 360 Eye contains a proprietary camera that takes a 360 degrees image of the room. The robot then picks several high contrast objects in the room (such as the edge of a picture frame or the edge of a piece of furniture) and builds an internal map. Using this map, and infrared sensors that locate obstacles, the vacuum is able to move about the room without having to turn around. The camera constantly watches the pre-chosen objects to track its location. The robot attempts to clean by creating a path that is no more than one robot's width away. Essentially, it picks a central point in the room and then makes a square spiral path outward. As it encounters objects, it makes the necessary adjustments to avoid them while still cleaning all areas. The theory is that the 360 Eye can clean the room without having to cross over areas that have been previously vacuumed. Avoiding backtracking over previously cleaned areas is important because the battery life of the 360 Eye is reported to be around 30 minutes (compared to roughly 2 hours for the iRobot Roomba). The 360 Eye won't have enough charge to waste time on an inefficient cleaning route. Of course, the robot will be able to return to and dock in its charging station before it runs out of charge. Like other Dyson vacuums, the 360 Eye uses cyclone technology to help it clean. With its digital motor that spins as high as 78,000 RPM, Dyson claims that the robot will have enough suction to pick up particles as small as pollen or mold. Another interesting feature is that the vacuum uses tank treads instead of wheels to propel itself. This should allow the robot to easily maneuver through uneven flooring transitions (think stone to carpet or stone to wood) without getting stuck or shifting off course. As with most modern devices, Dyson also has an app available for either iOS or Android. The app will allow the robot to be controlled and scheduled. You can even view maps of cleaning progress. The 360 Eye appears to be taller the the Roomba, so it may not be able to clean under beds and other low furniture. This may or may not be an issue for people. 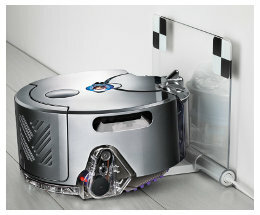 Overall, the Dyson 360 Eye seems to be a serious contender in the robot vacuum category. Unfortunately for us in the U.S., the vacuum is scheduled to debut in Japan first in early 2015 and sometime later in North America.